We are leading manufacturers of Limestone Grinding Plant With Diesel Engine. 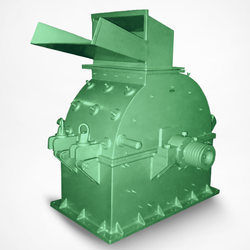 We are the leading manufacturers of Hammer Mill. Hammer mill is an economical unit designed for general all-round work for time-saving operation. Most often the only changes necessary are of Screens, hammers, and liners. 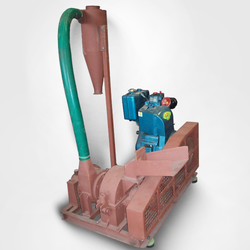 Air swept mill is especially designed for the medium fine & size reduction of bauxite, bentonite, barytes, coal, calcite, redoxite, china clay, fire clay, bricks, lime stone, feldspar, dolomite, soap stone gypsum, stertite, ochres, graphite, asbestos, food stuff, crude drugs, pharmaceutical products, dross separation, wide range of chemicals, pulses, agarbathi materials, dyes, pigments, tapioca, _tobacco, coconut shells, katha, charcoal etc. The in feed material is fed into the air stream at the mill inlet in a consistent metered fashion. The beater plates impact and reduce the size of the largest particles and distribute the material around the periphery of the grinding zone where product is ground against the liner by the hammers which are mounted on the beater plates. The beater plates rotate at between 1,600 and 7,000 rpm with tip speed velocities ranging from 19,500 to 34,000 feet per minute to achieve specific particle size distribution output. The classifier plate (5) separates the finely ground product for exit through the discharge outlet while returning oversize material back to the mill inlet through the recycle housing. Negative air pressure design keeps dust out of the air to eliminate health and plant hazards while resulting in clean conditions around the machine. The basic efficiency of the ASP design delivers an exceptional ratio of product yield to power consumption, processing time and related production costs. The Yagnam ASP is undoubtedly the easiest fine grinder on the market to clean, to change out wear parts, or to service the drive and bearings. ASP complete with feed hopper, set of separated top liners, set of side liners, Set of main shaft assly, set of bar hammer with carbide, set of air blower, V pulley for mill, V pulley for motor, V pulley for Air blower, Set of V Belt, Set of slide rail for motor, Set of Anti Vibration mounting pads, Set of safety guard for drive accessories Cyclone separator, pipe line, Mounting Stand for cyclone. Pin Pulverizer is specially designed to deal efficiently and economically with a wide range of materials and can be easily adjusted to give the fineness required from a coarse granulation to finely ground powder. 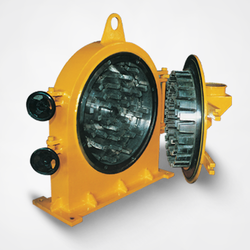 We provide our clients with the premium range of Pulverizers that are needed in many industries. These have a rugged construction and have high capacity. 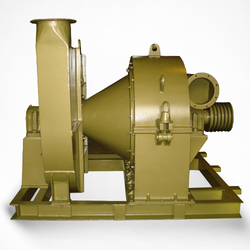 These support grinding of material to finely round powder that is just the exact size demanded for the process. Yagnam Pulverizer supply best price and quality of Hammer mill / Pulverizer machine for chemicals, chemical and Pharma machines. Chemical hammer mill machine is with high speed and fit for crushing materials with moderate hardness and viscosity. The material is fed into the milling chamber through a hopper and crushed by high speed rotating hammer. Chemical Pulverizer machine is easy to assemble and clean. Change the screen to adjust the output size. We use stainless steel to produce it, which assures that the final powder healthier cleaner. Simple and rugged structure, smooth running, good effect of pulverization. Operation is very simple. It is only needed to change sieve mesh in different mesh number, then the required fineness can be reached. Masala Mill is economical unit designed to all types of spices for time saving operations. All spices passes through a wide Feed Hopper into the grinding chamber. The swinging hammers in the mill chamber will crush the materials with the stationery top liners. The ground material is continually sucked by a powerful air blower through screen and conveyed through the pipe line into the cyclone separator for bagging. The air blower maintains constant atmospheric cool air flow in the mill chamber in order to obtain a cool product and continuously cleans the screen, thus increasing the output of the ground material. The particles size of the ground material can be varied by a changing the desired opening of the screen. The dust & ground material is gets separated in the cyclone separator. Top of the cyclone air balloon is fitted. The air balloon separates clean air & dust. The dust gets collected in air balloon. As soon as air balloon shakes the dust dropped into cyclone separator and get collected form balloon of the cyclone separator. Whole grinding operation is carried out in a cool atmospheric condition, which prevent their Volatile oil, colour & flavour from the products. Masala Mill complete with Feed Hopper, Machine assembly, Set of Top Liners, Set of Main Shaft assembly, Set of Bar type Hammer with carbide tip, Screen frame, Set of 3 Nos. Of perforated screen, 'V' pulley for mill, ‘V’ pulley for motor, 'V' pulley for Air Blower, Set 'V' belt, Set of slide rail for motor, Set of Anti-vibration mounting pads, Safety guard for drive accessories, Cyclone Separator with stand, PVC Pipe Line and Set of Air Balloon.